Labor Day weekend is a big one in Scottsboro, Alabama. Two important events draw crowds to the historic town over the three day celebration. One event has roots that run deep into the early 1900's, while the other is a bit more recent, but just as brilliant. According to the official Scottsboro website, First Monday Trade Days began in 1902, as a horse swapping event imagined by a local newspaper editor. James Armstrong, editor of the Scottsboro Citizen, dreamed up the cockamamie idea and, even though the first one was not a roaring success, Armstrong had the audacity to keep promoting it until it finally caught on. One of his reasons? To bring crowds into the city...sound familiar, Scottsboro? Today's First Monday begins on the Saturday before the first Monday of the month and the one on Labor Day weekend is the MacDaddy of all First Mondays. Each First Monday, including the Labor Day event, runs for three days, Saturday, Sunday and Monday, with Sunday being the busiest. 2014's Labor Day First Monday was jazzed up a bit by the addition of Dale's Stuft food truck. Dale sells five different varieties of stuffed baked potatoes: Cow Tater, Pig Tater, Chicken Tater, Turkey Tater and Garden Tater. I ran by Dale's after I had completed my shopping and picked up three taters for our dinner. Scott and Rob wanted Pig Taters and I chose the Garden Tater. I am not kidding when I tell you those taters were tasty! The combination of white sauce and bbq sauce is really divine. Scott said the pork was wonderful and the flavors on my Garden Tater were right up my alley...cilantro, lime, corn, black beans, green onions. Oh, yes, it was so good! But the taters were at the end of my day, so let me back up! I arrived on the square in time for an early lunch at the Veranda Catering Company. Veranda had a special $5 menu just for the Labor Day weekend. One of the items on the menu caught my eye and since I had been hearing lots about the Veranda's chicken and waffles, I decided to try them out. Chicken and waffles are one of dishes I have been curious about, but have never tried. It sounds like an odd combination and I am not sure how they were invented, but it was a sweet idea. Veranda's chicken fingers with waffles and maple syrup are a marriage made in heaven. As I was polishing off the last of my meal, I kept noticing the beautiful plates popping up on other tables. Yes, I am nosy! I saw some delicious looking sandwiches, strawberry pretzel salad, sweet potato fries and desserts. Made me want to order a second round, but I knew I had taters to look forward to! After leaving the Veranda, I strolled around the square, checking out the vendors and talking to friends along the way. I ran into my friend, Kelli, who had just polished off an entire tiger's blood shave ice with extra, extra cream and did not leave one smidge for me to photograph. She said she bought it for her son, but I noticed he was nowhere around and when I dusted the cup for fingerprints, his were not there! The local Three Arts Club sponsors Scottsboro's popular Art in the Park event. Paper Moon is one of the favorite vendors at Art in the Park. From First Monday, I hopped in my car and drove down to Caldwell Park to the other big Labor Day weekend event, Art in the Park, hosted by Scottsboro's Three Arts Club. This year's event was the 41st annual occurrence of the art fest. Proceeds from the event support art and educational endeavors in the community and talented vendors from all over come to share their creations. Everything from jewelry and paintings to candles and soap can be purchased at the tents set up under the shady canopy of trees in the park. WhimC is one of the local vendors with cute and colorful crafts. Love this vendor's clever booth. And for those who didn't dine on the square, there were plenty of food choices, too. BBQ, lemonade, chicken salad sandwiches and kettle corn were all available and looked delicious. My talented friend, John Warr, always supports this local event by bringing his amazing art. John does realistic wildlife and civil war paintings, as well as paintings of local scenes. 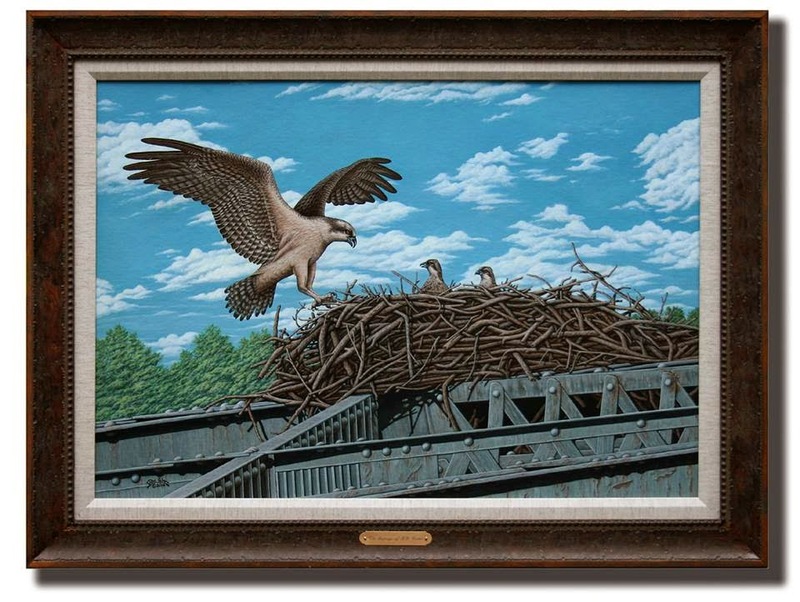 His latest, The Osprey's of BB Comer Bridge, commemorates the beautiful birds that have made their home on Scottsboro's historic old bridge. One of my favorite vendors is Paper Moon, the brainchild of two talented sisters. Their paper maché creations have the feel of a Tim Burton movie and their booth is always one of the most popular in the park. Don't you just love this mischievous looking jack-o-lantern? My friend, Lavinia, snagged a trio of pretty leather, freshwater pearl and stone necklaces. She shared them with me, so I could share them with you. Here are a couple of them. Unfortunately I didn't get the name of the vendor, but I am sure we could find out. I found my own pretty pottery necklace at a booth called Artjewelz. My friend, Shannon, learned the importance of making up your mind when shopping near me. As soon as I told the owner I would take this cute Auburn tiger paw, Shannon acted like I had taken it out of her hand! I had to laugh at her...but I didn't put it down! Next time I bet she makes her choices known! Too bad it was the last one! She was in luck, though. The owner is going to mail hers. And now we are right back where we started. I left Art in the Park and wheeled right back to the square, where I picked up three piping hot, over stuffed, baked potatoes and headed home just in time to avoid the torrential rain that began to pour from the sky. All in all, I would say it was a great day to be in Scottsboro, Alabama!